Bedfont® Scientific Ltd. specializes in research, development, and manufacture of breath analysis monitors for a variety of medical applications. This article explains why a 15 second breath hold is needed for the analysis of breath carbon monoxide (CO), methane (CH4), and hydrogen (H2). CO gas is colorless, tasteless, and odorless that results from incomplete combustion. When this gas is inhaled, it combines readily with hemoglobin, over 200 times more than Oxygen (O2), to create carboxyhemoglobin (COHb). However, CO is also highly toxic. CO breath testing is utilized as the de facto standard method in smoking cessation programs in order to ascertain smoking status, encourage smokers to stop, and teach them about the dangers to their health. CO monitors are also used in the emergency setting to diagnose CO poisoning. The most abundantly available element in the universe is H2. This gas is colorless, odorless and lightest of all gases. The chemical compound CH4 contains four atoms of hydrogen and one atom carbon. The human digestive system produces both H2 and CH4. When there are functional or structural disorders of the gastrointestinal tract, bacterial overgrowth can occur in the small intestine with proliferation of colonic bacteria in the jejunum and ileum. Small intestinal bacterial overgrowth, or SIBO in short, is characterized by diarrhea and steatorrhea, along with carbohydrate malabsorption and vitamin deficiencies. Accurate diagnosis of this syndrome is difficult using blood tests. In such situations, the basis for breath testing is that intestinal bacteria can produce methane and hydrogen by breaking down carbohydrates. Bacterial fermentation of carbohydrate in the gut is the only source of these gases in alveolar air, and therefore estimation of methane and hydrogen in breath samples can be utilized to explore the passage of carbohydrates via the gut as well as the presence of pathogenic bacteria in the gastro-intestinal lumen. Breath CH4 and H2 is used as a safe, non-invasive alternative to complex procedures such as biopsy to assess constipation, diarrhea, malabsorption, and bloating. In the 1970s and 2006, studies showed that about 35% of healthy adult subjects produce CH43. In addition, other research found an increased CH4 percentage of more than 100% in 34% of patients with lactose intolerance and who showed a negative H2 breath test. How do these gases reach the lung? From a physiological standpoint, the mechanism involved here is simple diffusion, from high to low concentration. The alveoli are miniscule air sacs located inside the lungs, each of which has a wall that measures just one cell thick, as shown in Figure 1. A net of capillaries surround each alveolus and they too have walls which measures just one cell thick. These capillaries are so narrow that red blood cells are forced to pass through them stacked up in line, carried by plasma one at a time. When blood enters the lungs’ capillaries, hemoglobin on the red blood cells is loosely coupled with CO, which it collected from the body's cells, while the plasma carries the CH4 and H2. Each alveolus contains oxygen, which is taken in by inhaling the air outside the body. During this time, the concentration of CH4, CO, and H2 is greater in the blood than in the alveolus, while the oxygen concentration is greater in the alveolus than that of the blood. Hence, CO, H2 and CH4 released by plasma and hemoglobin directly diffuse through the cell walls of the alveolus and capillary and into the lung in parts per million (ppm) concentration. 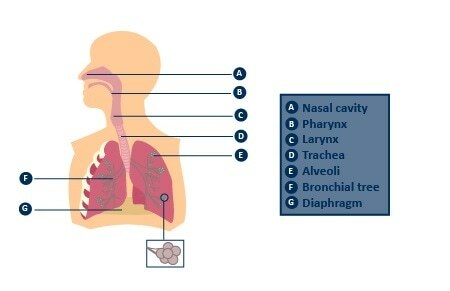 When humans exhale, the CO, CH4, and H2 present in the lung is flushed out, thus holding the breath enables more of these gases to diffuse into the lung. These gases will continue to diffuse into the lung until they reach the same level of that in the plasma and hemoglobin, thus achieving ‘equilibrium’. Study has shown that the time point, at which the concentrations of CO, CH4 and H2 in the breath equilibrate or flatten to that in the blood, is between 15-20 seconds. 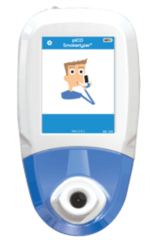 Consequently, Bedfont® has shown that a 15-second minimum breath hold is needed to accurately measure the concentrations of CO in the breath, because this enables the gases in the lung to equilibrate and is short enough to make it comfortable for patients to execute the test. Environmental air contains about 78% nitrogen (N2), 20.9% O2, and 1% argon (Ar)7. Upon inhalation, the human body converts some of the O2 into CO2 (carbon dioxide), which is deposited in the base of the lung. This is clinically referred to as the end-tidal sample. Here, 6% of O2 is converted into CO2, thus resulting in an end-tidal sample that contains a constant 14% O2 and 6% CO2. Studies have shown that the end-tidal sample contains the highest and thus most accurate concentrations of CO, CH4, and H2. Hence, the O2 levels are also monitored by the GastroCH4ECK® when analyzing a breath sample, because O2 is constant in end-tidal samples and thus shows that an end-tidal sample has been obtained. In doing this, the level of CH4 and H2 is found to be accurate. If O2 levels are higher than 14%, it means an end-tidal sample has not been attained and is hence diluted by dead space in the upper airway. Therefore, the monitor offsets this with a correction ratio. Bedfont® hence specifies that the patient must exhale slowly for the most accurate breath sample, but more importantly, they must completely empty their lungs. Monoxide Concentration in Cigarette Smokers. Addictive Behaviours Vol. 9; pp. 307-309, 1984. M. Levitt et al – Influence of Method of Alveolar Air Collection on Results of Breath Tests. Digestive Diseases and Sciences, Vol 43, No. 9 pp.1938-1945, 1998.